In the last month of not updating the blog, I have gotten married, gotten a new apartment, and attempted to move everything here without resulting in a broken pile of pewter and plastic! As I settled in, I've done some work on the Morats, and decided to start prepping the Nomads for painting. A friend and I swapped models from two boxes of Operation: Icestorm, resulting in us each having two of everything. I have determined to not have utter duplicates in the force, meaning I need to convert seven models of the box. Luckily, the two male Alguaciles could get away with a simple arms swap, but the female Alguacile was a bit more of a challenge. Corvus Belli loves giving its female models pinup poses, but luckily there was enough gap between the legs to pull them to a wider (if still a bit hippy) stance, and her arms were thin enough to carefully reposition into a firing stance. ...the one problem was the hair. I had to change it, and the only thing for it was a trip to the barber's shop! I first carefully cut off all the hair and shaved her head down to just a scalp. This took some careful gouges/cuts with a boxcutter, and even closer trims with a craft blade. Then came careful puttying of the short hair around the sides and back of her head. 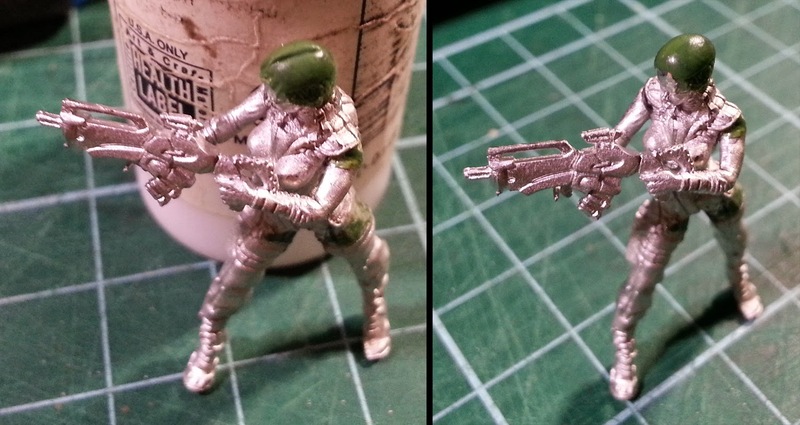 I wanted to go with a more military-standard short cut, with a bit of a bizarre flare. I want to make the Alguaciles (and Nomads in general) look as though they struggle between professional military and individualist themes. 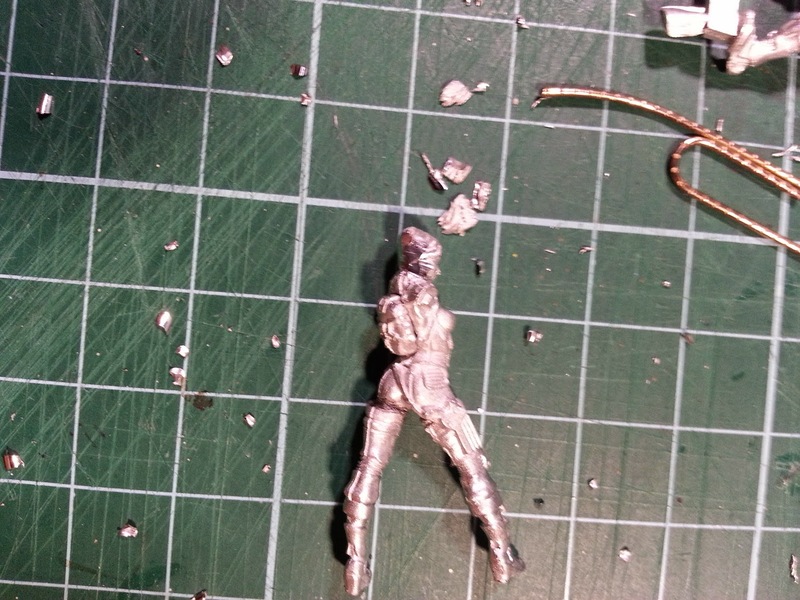 You can also see in this one the modifications to the body pose. Next up, after the first round had dried, I added a blob of putty to the top, gave it a part, and pulled it down on the far side, to give a bit of individual style. As usual, I tend to work fast when I get closer to the final stages, so here's a 'finished' shot: I used a craft knife to turn the blob into individual hairs or clumps, gave her a single lock over the forehead, and then a hairstyle that's very short on the left, gradually getting longer around the back of the head until it hangs down to the jawline on the right side. Next up I'll put on photos of the other two Alguaciles. I'm hoping when painted the hairstyle will work. 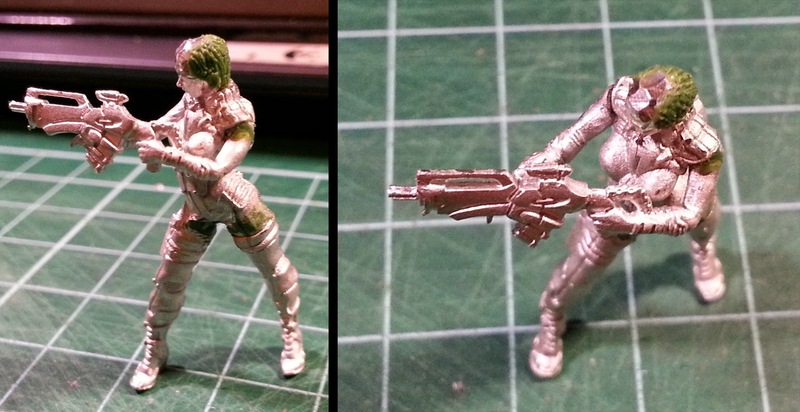 I will likely give her a black wash to see if anything stands out. See you hopefully sooner than another month from now!